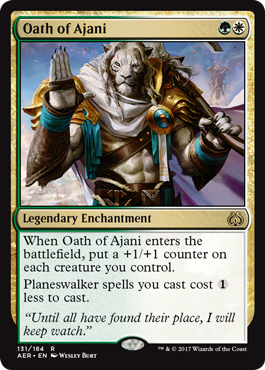 Overall Thoughts: This Ajani would be great, if he didn’t cost 6 mana. As such, I think he’s still really good and will see a lot of play. His +2 ability brings his starting loyalty up enough that he shouldn’t die to one attack. His -2 ability is fabulous (who doesn’t love a repeatable Swords to Plowshares?). And his ultimate ability, while not likely to happen, will be very powerful when it happens. Looks like a lot of fun to play with. 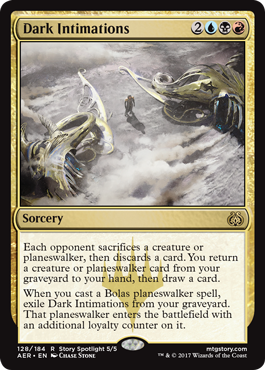 Overall Thoughts: While this card can certainly be powerful (it’s like a sort of mini Cruel Ultimatum), I don’t think it’ll see much play until Amonkhet comes out (assuming Nicol Bolas makes his appearance in that set). 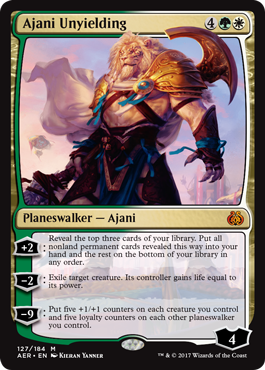 Financially, I expect this to be a bulk rare initially, and it’s price will rise once the new Bolas planeswalker is spoiled. Overall Thoughts: Once this card is in play, for the low, low cost of 1 mana, you can scry each turn (assuming you sacrifice the Servo this card makes). Seems like a good investment to me. And if your deck has other ways to blink your cards, this card gives you pure value. 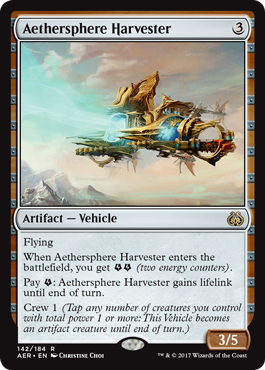 Overall Thoughts: The fact that this card makes two Thopters is very nice. I have a feeling this will see way more play in Limited than it will in Standard, though. 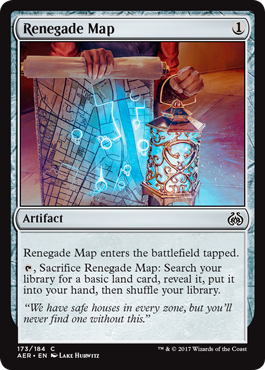 In Standard, the Red/Blue decks are usually trying to cast non-creature spells, so I don’t see this card as having a home there. Overall Thoughts: When this card was first spoiled, a lot of people flipped their lids when they saw it. And for good reason. Most people think this is a great turn 2 play. 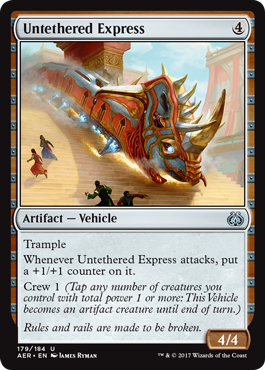 I agree, but I also like this as a turn 4, 5, or 6 play as well, because by then you should have some creatures on board that this will pump up. Did I mention that I like +1/+1 counters? I hope there’s a new Green/White deck created that will allow this card to shine. Overall Thoughts: The ability on this card is great, but our current Red/Green decks usually utilize energy in some way, and this card does nothing to further those decks. 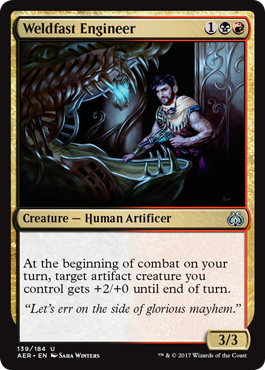 Maybe he’ll fit in better when Amonkhet comes out. Overall Thoughts: Here’s another example of a card that doesn’t seem to have a home. 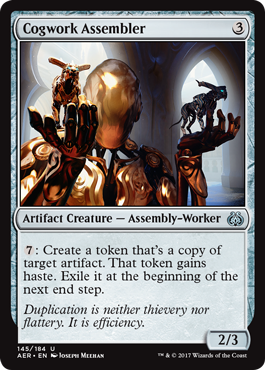 I like that you can possibly get back a creature that costs 2 mana or less that was destroyed earlier in the turn, but I’m not sure just how good that will be. I think this might see some fringe play, but it won’t be featured in the best decks in Standard. Overall Thoughts: Here’s a card that fits into an existing deck archetype very nicely. 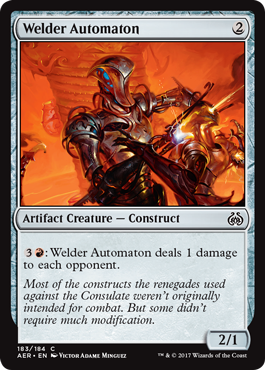 Imagine this card singlehandedly crewing Skysovereign, Consul Flagship, dealing 3 points of damage to destroy one of your opponent’s creatures and targeting another one so that it can’t block. Sounds pretty sweet to me. 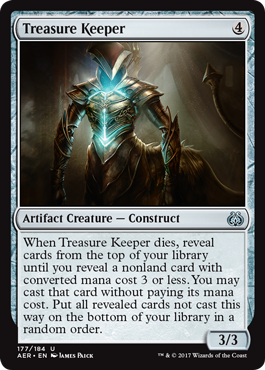 Overall Thoughts: Wow, for 3 mana we get to draw a card, gain 2 energy, and we get a 3/2 creature to boot. 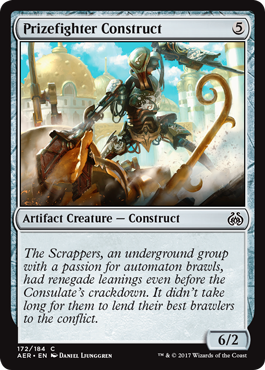 This card screams value to me, and will certainly be seen in Standard. Overall Thoughts: With Reflector Mage getting banned, will this be the next big card for Blue/White control decks? Probably not, but that’s not to say it’s a bad card. 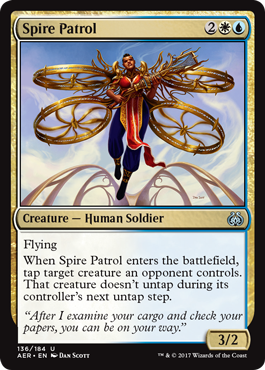 My only issue with it is that it’s stats are not what I would hope for for a 4 mana creature, but it does have flying which helps a little. This card will probably see some fringe play at best. 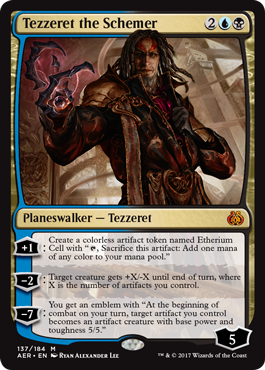 Overall Thoughts: As far as planeswalkers go, Tezzeret has some pretty nice abilities that work well together. Make a few Lotus Petals (Oops. I’m sorry, I mean Etherium Cells), then either use them to boost the removal power of his -2 ability or go ultimate and start making them into 5/5 wrecking machines. I see a lot of potential here. 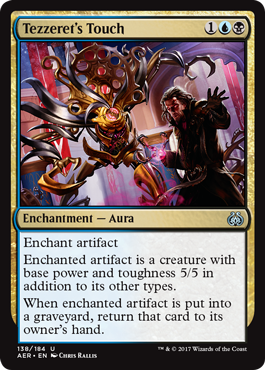 Overall Thoughts: While not as good as Ensoul Artifact, the extra (Red) mana needed to cast this card allows you to return the artifact this is enchanting to your hand once it dies. That’s a nice ability and could end up being helpful. 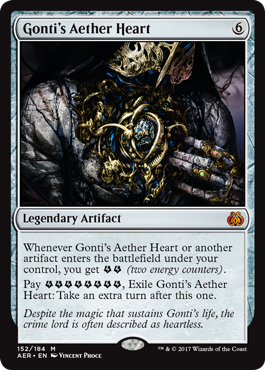 Overall Thoughts: This card could find a home in an aggressive Reb/Black artifact deck. 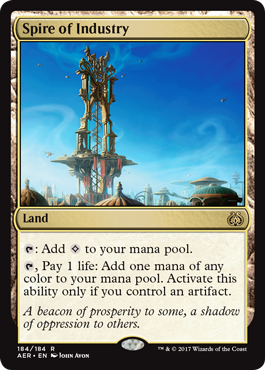 It’s nice that the bonus this grants will trigger the turn it is played, assuming you cast it in your first main phase and that you have an artifact creature in play that can attack. 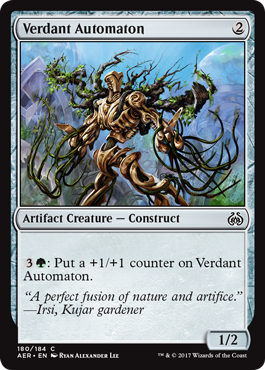 Overall Thoughts: My only complaint with this card is that it’s going to make me have to play an Abzan deck instead of a Green/White deck. Seriously though, I love this card. (Did I mention that I happen to love +1/+1 counters?) 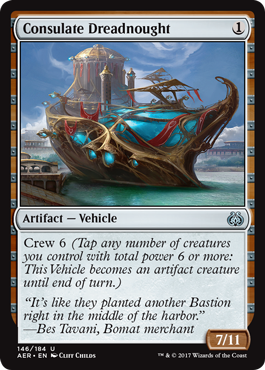 This card looks like it’ll be a blast to play with, and I expect to see a lot of brewed decks in Standard with it. 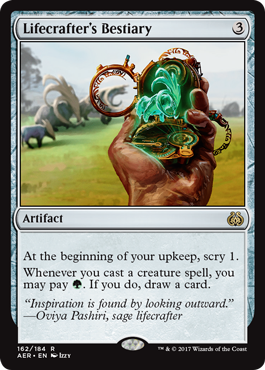 Also, keep in mind that not only does it add additional counters (of all kinds, not just of the +1/+1 variety) to your artifacts and creatures, but it also will increase any counters you may get (such as energy). Overall Thoughts: I think this card would have been a really good card if the activation cost wasn’t so high. As it is, this card will see very little play. 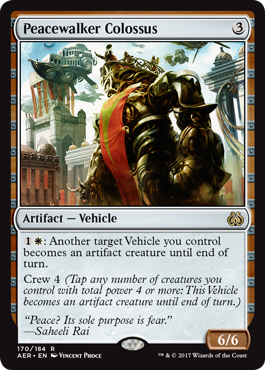 Overall Thoughts: This card has a good chance to slot right into the current Red/White vehicles deck. Having a crew cost of 1 really makes this card good. 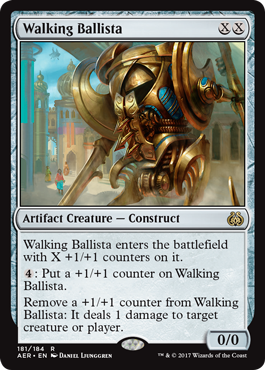 The drawback to this card is the casting cost of 3, so it’s a little slow, but the lifelink this can provide makes up for that. This is a good card that will see Standard play. Overall Thoughts: Yuck. A 1/1 for 1 mana isn’t worth it, even if it has the capability to pump itself. This doesn’t even have any sort of evasion, so it’s easy to block. I don’t expect to see this card in Standard at all. 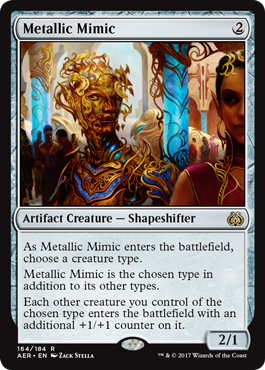 Overall Thoughts: This card isn’t good, but I could see it being played in some sideboards. The nice part is that it has Improvise, so you could likely cast this by turn 4 in the right deck, and it will be tough for your opponent to continually block this. Also, the thought of casting Built to Smash on this makes me smile. 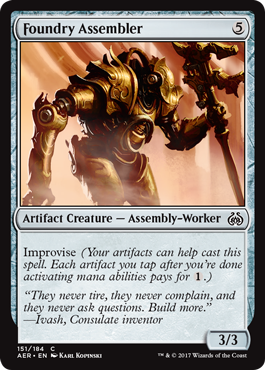 Overall Thoughts: Here’s another Assembly-Worker for your tribal decks. Seriously though, this card isn’t very good. 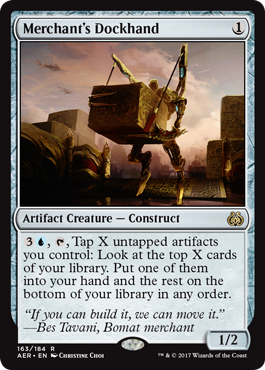 In the right artifact / ramp build, it could find a home, but I doubt that will happen. 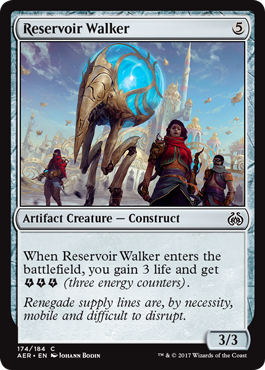 Overall Thoughts: While I like the combo of this card and Peacewalker Colossus, I don’t think this will be quite good enough to break into Standard. The crew cost of 6 is simply too much of a hindrance in most cases for this to see widespread play. 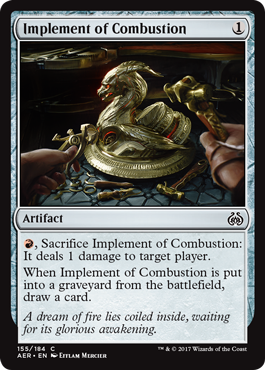 Overall Thoughts: This card is a nice source of repeatable energy production, and with certain cards that add to the amount of energy this provides (I’m looking at you, Winding Constrictor), this could be quite good. As it stands though, it’s not good enough on it’s own to see much play. I do think this will be seen in some fringe decks though. 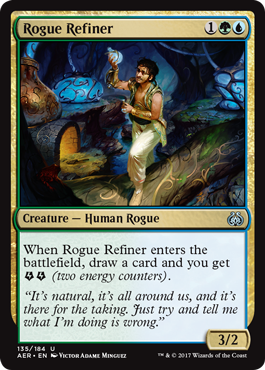 Overall Thoughts: This card looks like crazy fun when paired with Wandering Fumarole, and I do expect that combo will see a little play. 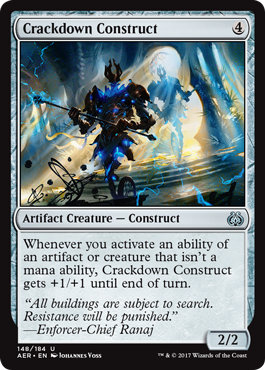 But without having a way to provide your extremely large Construct some sort of evasion, this just becomes a big creature that your opponent can chump block. 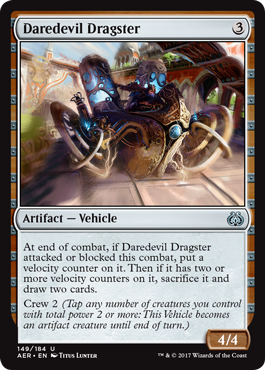 Overall Thoughts: Getting a 4/4 for 3 mana would be great, and this card would be awesome in a deck that has a way to get rid of velocity counters. Perhaps alongside Eldrazi Displacer? It seems like a lot of work just to have a 4/4 vehicle and it’s probably not worth it. 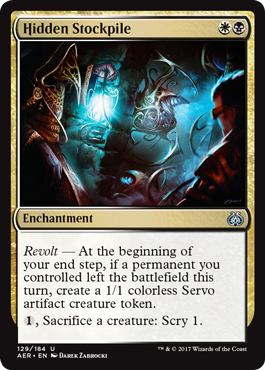 Overall Thoughts: I expect this will find its way into decks that want to trigger Revolt, but it’s just not an exciting card to play. This card just seems mediocre to me. 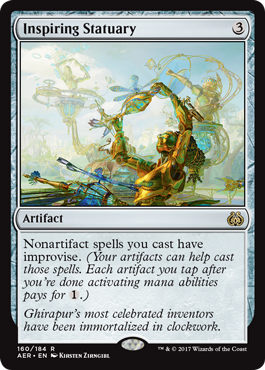 Overall Thoughts: If Improvise becomes a thing in Standard, this card might see more play than I think. As it is, I think there’s a little too much work required to get this 3/3 into play when you want it. 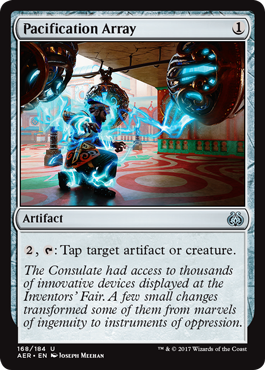 Overall Thoughts: While this is a bit pricy, I expect to see this played in decks that are hoping to utilize energy in an unfair manner. 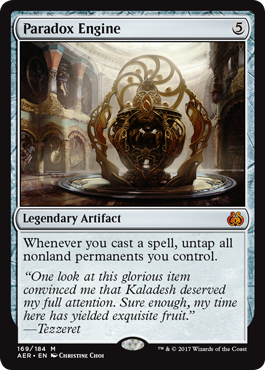 I wouldn’t mind hitting this with an activation of my Aetherworks Marvel, even if I have better threats in my deck. Overall Thoughts: Is this the successor to Smuggler’s Copter? Only time will tell. In the right build, this has the potential to be bonkers. I love vigilance, and the fact that this can be crewed without tapping your creatures is amazing. 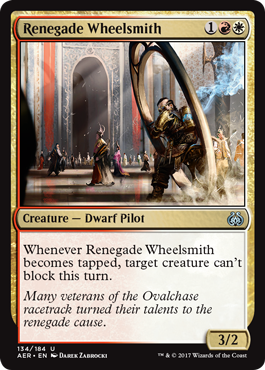 Will this card make the Planeswalker Deck planeswalkers playable in Standard due to the fact that activating them usually adds more than 1 loyalty counter? I’m not sure, but it’s something to experiment with. 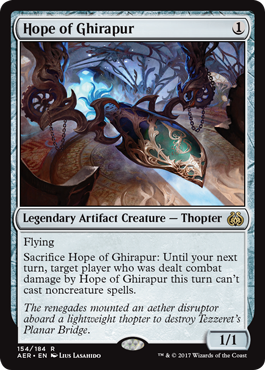 Overall Thoughts: If this card is Ghirapur’s only hope, I think the Ghirapurians are in trouble. I like that this is a 1/1 flyer for 1 mana. I think its ability when it is sacrificed is great against the right deck. 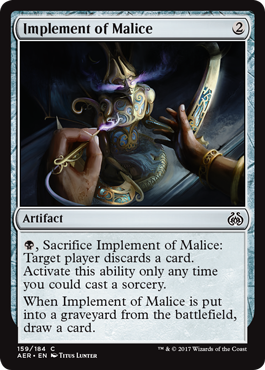 But I don’t like that you can only get the benefit from sacrificing it if you successfully deal combat damage to a player with this card. 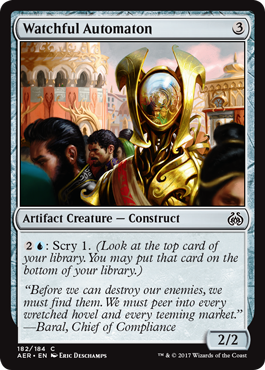 I think this is a good sideboard card, but it’s hard to justify playing 4 copies in your main deck. Overall Thoughts: All of the Implement artifacts are great ways for you to trigger Revolt. This implement doesn’t seem very strong, only being able to deal 1 point of damage to a player and drawing you a card. 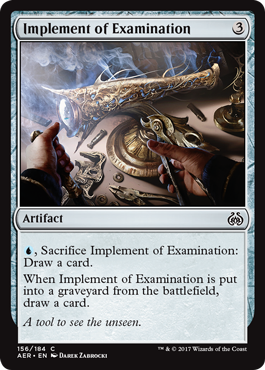 But if you could find a way to recur this from your graveyard, you could get a cheap engine going that would ping away at your opponent’s life total. Overall Thoughts: 4 total mana to draw 2 cards seems about right. I’m sure this will see play in control decks, as gaining card advantage is highly important to those decks. Overall Thoughts: While I don’t doubt that this will see play in fringe decks looking to take advantage of +1/+1 counters, I’m not sure it’s powerful enough to break into Standard. 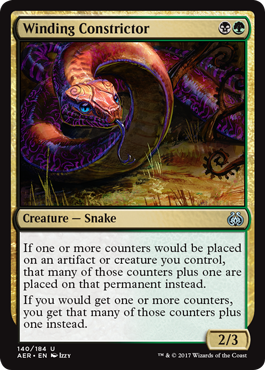 As a fan of +1/+1 counters, though, I’m hopeful it will. Overall Thoughts: I’ll be surprised this card sees any play at all in Standard. Gaining 2 life is nice, but it’s really not worth taking up a slot in your deck, even if it does replace itself. Overall Thoughts: Forcing your opponent to discard a card is so much better when you get to choose the card they discard. This is another card that gives your opponent the power to choose for themselves, so unless they only have 1 card in hand and you know it’s a powerful spell, this card isn’t worth your time. 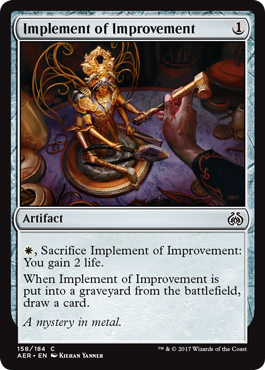 Overall Thoughts: While I can’t say for certain just how good Improvise is, I can say that I’m certain this card will make its way into some Standard decks. Any ability that allows cards to be cast cheaper than their converted mana cost will definitely be brewed with. Overall Thoughts: I’m just not a fan of this card. It costs too much mana and has too high of a crew cost to see any Standard play. Overall Thoughts: Okay, so this is a card that when played on curve does nothing until your next turn. That’s not great. But what is great is Green having access to card draw. 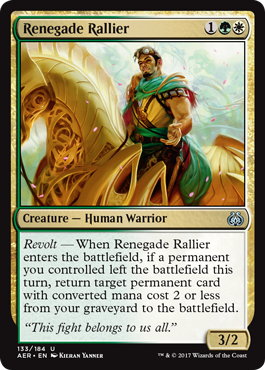 Sure, it costs 1 mana each time, but since green has access to cards that supply +1/+1 counters and Rishkar, Peema Renegade you have a few ways to mitigate that cost. Overall Thoughts: While it’s a little expensive, the card selection this card can offer you is pretty good. I can see this being played in Blue control decks. Overall Thoughts: This is a great card in tribal decks and a good card in other decks that play multiple creatures of the same type. I have no doubt this will see some Standard play. And it’s nice that this only costs 2 mana, so it can come down early to help buff your team. The downfall is that it’s really fragile, so you’ll need to do what you can to keep it alive. Overall Thoughts: Here’s another vehicle that’s a little expensive to play, but it has good stats. 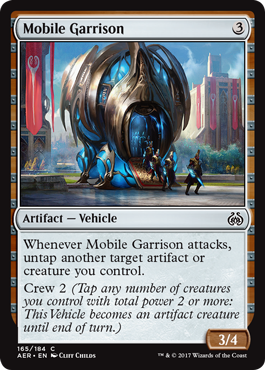 The crew cost of 2 is nice, and the fact that this can untap an attacking or crewing creature so they can be used for defense on your opponent’s turn. This is a pretty good common. 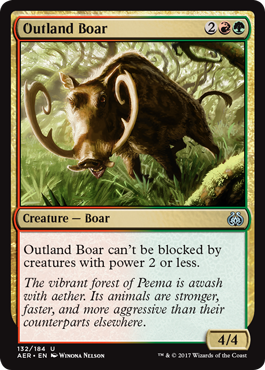 Overall Thoughts: The ability to block an additional creature each turn is nice, but the 1 toughness this card has makes this a one-time blocker. This card might be sideboarded in from time to time, but won’t be a player in Standard. 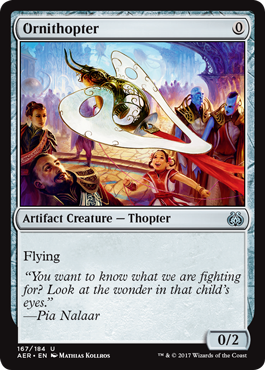 Overall Thoughts: Ornithopter’s back, and with new artwork! This card will see a lot of play in Standard as it serves so many roles. It’s a flying blocker. It’s an artifact that can help you cast spells with Improvise. It’s also a potential threat when backed up by pump spells. It’s a great blast from the past and will see a lot of Standard play. Overall Thoughts: This card could be quite useful in a control deck. It’s nice and cheap, so it can be played early, and its activated ability doesn’t cost a lot. 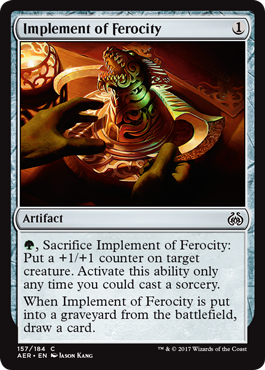 I think this is mostly a sideboard card that you bring in against certain opponents that run creatures that you can’t handle immediately. 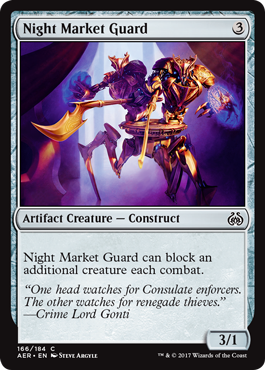 Overall Thoughts: The mana cost to cast this is a little high, which will limit its play some, but this is a really strong card. It can effectively give all of your creatures vigilance if you wait to cast any spells until after your combat phase. This card will be a player not only in Standard, but in other formats as well. Overall Thoughts: I know I’m biased, but I think this card is a great card. 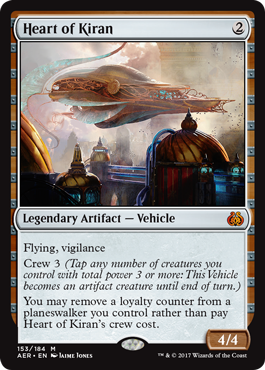 It’s likely worse than I think it will be, but I have a feeling this will be a great addition to the Red/White vehicle decks. This singlehandedly makes any vehicle, no matter how high its crew cost is, into a wrecking machine. I’m looking forward to playing with this card. 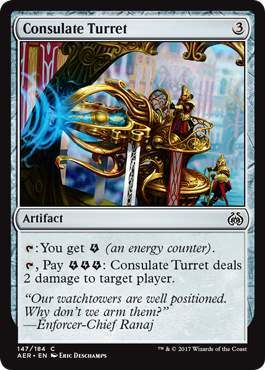 Overall Thoughts: This card is likely too expensive (both to cast and to activate) to be a contender in Standard. In other formats, however, I think this card will be an all-star. Overall Thoughts: Expensive, bad stats, and no sort of evasion. That’s three strikes against this card, so I’d say it’s out (yes, that’s a baseball reference). Overall Thoughts: Here’s a card that is decent for mana fixing, if you’re looking to add basic lands to your battlefield. What it does is useful, but not flashy. It’s likely in the set to help fix your mana in Limited play, but it could see some fringe play in Standard decks looking to splash a color. Overall Thoughts: This is another artifact that I would consider okay, but not great. If you have a way to blink this creature, you’ll be very happy with it, but if not the one-time life and energy gain will be good but the stats you get on the battlefield will have you wishing for more. 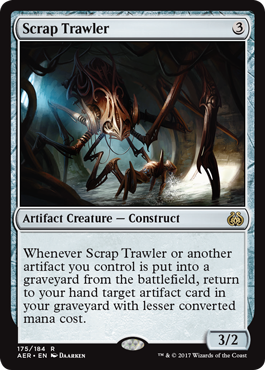 Overall Thoughts: Here’s a nice engine for you to use to recur artifacts from your graveyard. The ability to get artifacts back to your hand from your graveyard is nice (obviously it would be better if they came back to the battlefield, but there would need to be some sort of drawback). 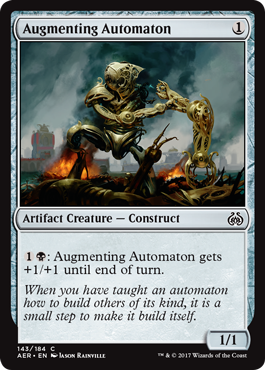 This card will see some play in decks looking to play artifacts multiple times. 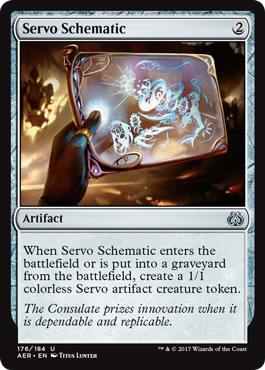 Overall Thoughts: Is it just me, or is creating Servo tokens pretty unexciting? That’s exactly how I feel about this card… unexcited. 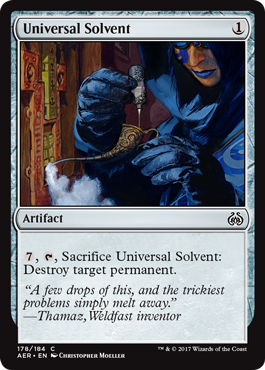 If you have an easy was to get rid of this card, you do get 2 Servo tokens for 2 mana, but it hardly seems like it’s worth your time. Overall Thoughts: Hey, look. This card has a death-triggered Cascade effect. That has to be good, right? It probably is if you’ve built your deck with this ability in mind. This will likely be playable in Standard in the right deck. Overall Thoughts: It’s great that this card can destroy anything (as long as that thing isn’t indestructible). What’s not great is the activation cost. That’s what will keep this from seeing any Standard play. 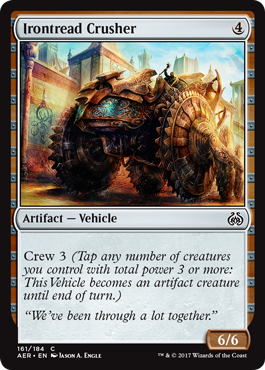 Overall Thoughts: The 4 mana needed to cast this is the only drawback I can see for this vehicle. Trample is great, and you know I love +1/+1 counters, and the crew cost of 1 means that it’s easily crewed by just about anything. Overall Thoughts: As much as I love +1/+1 counters, I just can’t seem to love this card. It’s too small when cast to be much of a threat, and the cost to add a counter to this is too expensive. This won’t see play in Standard. 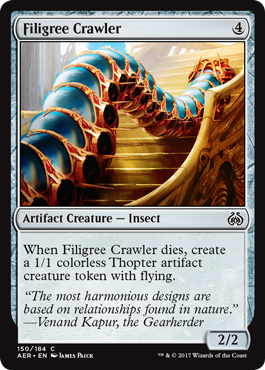 Overall Thoughts: It’s a little expensive, but I can see some upside in this creature. 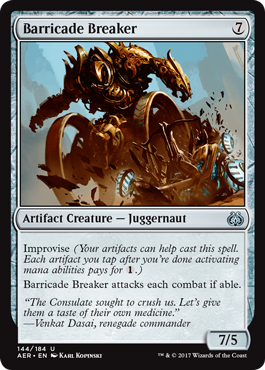 The fact that the ability to remove a +1/+1 counter from this to deal 1 point of damage to your opponent or a creature at any time is very nice, especially since it can be done in response to this being destroyed. It reminds me a little of Hangarback Walker, but it’s not nearly as good. Overall Thoughts: Being able to scry every turn is nice, but I don’t think that will allow this to see much Standard play. 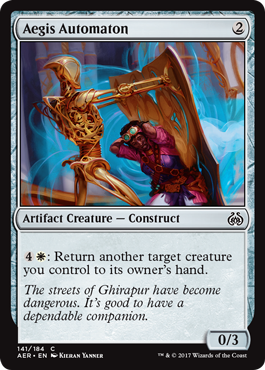 Overall Thoughts: I like repeatable ways to deal damage to my opponent, yet I don’t like this card. It’s too fragile and it’s too expensive to deal 1 point of damage to your opponent. I don’t see this being a player in Standard. Overall Thoughts: Since most decks nowadays will have a few artifacts in them, this card seems pretty good. It’s a nice way to fix your mana for the low, low price of just 1 point of your life. That seems like a bargain to me. I think this will see a fair amount of play in Standard. 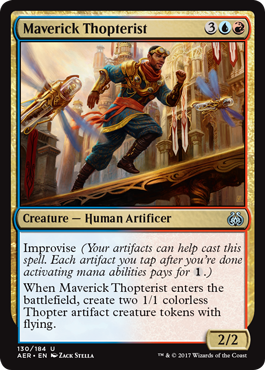 And with that, we’ve finished reviewing all of the cards in Aether Revolt. This set has a few very powerful cards, and a whole mess of other cards that look very fun to play. Now that all of the cards have been reviewed, how do you think I did? Did I nail everything (yeah, right) or were there cards that I misevaluated (much more likely). Let me know in the comments section below. Because of this week’s set reviews, there will be no Raise Your Standards this week. Be sure to check back next Friday for the next installment when we’ll take a look at some innovative decks of this new Standard environment. Thank you for joining me all this week for these reviews of the newest. Hopefully you can all attend a prerelease this weekend so you can get your hands on the new cards and start brewing with them. I’ll be attending one with my wife and daughter at my local game store (J&J Games in Marshfield, WI) and possibly another at a shop about an hour away (Galaxy Comics, Games, & More in Stevens Point, WI) if I’m able. Make sure to support your own local game store whenever possible and if you’re able to attend a prerelease, have fun!